RoboForm is one of the most helpful tools a comper can use. It makes password management and form filling fast and simple across all your devices – allowing you to log in to websites quickly and easily on your phone, tablet and computer. Most web browsers now have an Autofill function built in, which will save passwords, your name, address, phone number and other details that you regularly have to input. RoboForm is much more powerful, with custom fields and the ability to save details from specific entry forms so you don’t need to type the same thing over and over. Roboform can even generate strong, random passwords for you – perfect for those websites where you have to use a password with ‘more than 8 characters including a number and a capital letter’! RoboForm is completely free for the first 10 website logins/passwords you save – once you have more than that, you should upgrade to RoboForm Everywhere. If you only use it for competitions or sweepstakes, the form-filling function might be all you require – but upgrading does give you unlimited logins and custom fields, which are handy for comps! You can download the Roboform app for free on a tablet or mobile device. To access it you can use an optional 4 digit pin code, and your main Roboform password – you can change the level of security in your settings if you don’t want to input the code and password every time you open the app. Rather than opening a browser on your phone, you browse the internet via the Roboform app. Tap the home button to see a list of your logins, quickly go to websites, and tap the profile icon to fill forms. Free Roboform limits you to ten logins. If you comp from multiple devices, it’s worth purchasing Roboform Everywhere, which syncs your information in the cloud – this is what I’ve been using for years! You can download Roboform Everywhere here – you will need to pay a subscription fee annually to continue to access your logins across unlimited devices, but with website security measures getting more complex and people using more computers and phones, I believe it’s well worth it. Roboform saves logins for individual websites – these are your log in and password details. This means you can quickly log in to your favourite forums and websites. Roboform is powerful for compers as it can save forms for specific websites – for example, if you enter the same prize draw daily, you can tell Roboform to save the exact form information – then when you visit the site the next day, you can simply load up that information to fill the form! 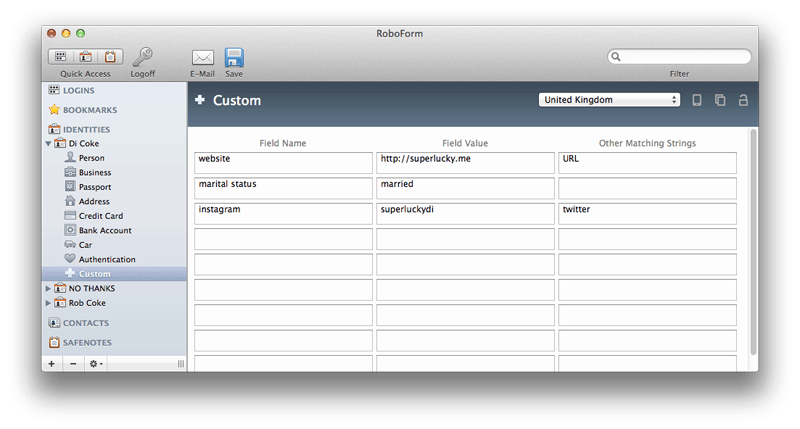 Roboform stores multiple identities – you can add and edit these easily, and choose to fill as many fields (name, address, date of birth etc) as you like. You can also add identities for family members. On a computer these logins will appear on a toolbar in your browser (except Chrome, which gives you an icon and drop down menu) – simply click the relevant name to fill out a form. With free Roboform you can only add three custom fields to an identity. Custom fields are great for compers – you can specify which text/question Roboform should look for on a web page, and the text it should fill in (or box it should tick) if it finds it. For example, in my own Identity, I’ve added Twitter, and asked Roboform to complete that with ‘superluckydi’. Alongside that, I’ve got ‘Instagram’ as a matching string which requires the same answer – if I enter a blog competition for example, where I need to leave an Instagram and Twitter ID in two consecutive empty boxes, Roboform will fill both with ‘Superluckydi’ when I click the ‘Di Coke’ Identity. If you enter blog giveaways, you’ll like this feature! There are several websites and online magazines (an example is www.goodtoknow.co.uk) which will show you a list of ‘tick box’ questions before you can submit your prize draw entry. 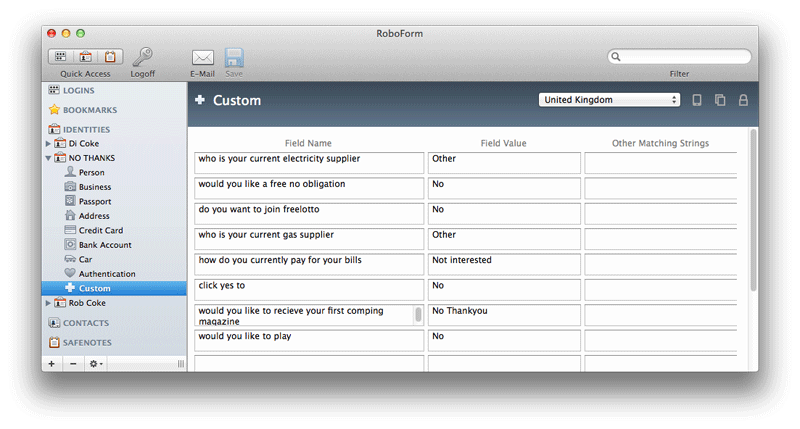 You can teach Roboform to tick ‘No’ on all those annoying boxes, by using custom fields – I found out about this via this super post on the MSE forum. Set up a new identity, call it ‘No thanks’ and then edit it to add Custom fields. Many of these are standard question types; you can just use the opening few words of a question in the fields. Then when Roboform finds those words, it will automatically tick the specified box (usually No or No Thanks). Do remember to check everything is OK before submitting your form though. My own example below shows a basic set up, check the MSE thread for lots more suggestions – you can include plenty of questions in the ‘Other Matching Strings’ column too. Is Roboform classed as an ‘automated entry’? One of the common questions about Roboform is whether it’s classed as an ‘automated entry’, and is there a risk of Roboform entries being excluded from a draw? Automated entries are actually something entirely different – they are ‘third party’ entries generated on a large scale. For example, a computer programmed to input 10,000 entries into the same prize draw – these are on behalf of consumers who have paid to subscribe to the services. Many promoters disallow entries from Automated Entry Services, which is why you’ll often see “Automated entries, bulk entries or third party entries will be disqualified” in the terms & conditions of a prize draw. If a promoter really doesn’t like automatic form filling, they can set up their form so it won’t actually let you use Roboform or Autofill. In most cases though, promoters don’t mind at all – it means less chance of a typo in the winner’s phone number or email address! Hopefully that should give you an idea of why Roboform is popular with compers – particularly those who enter hundreds of draws every day! If you do decide to download it, you can find a handy support section offering video tutorials and the full Roboform manual on the Roboform website. Thanks for the competition. I entered even though I already used Roboform as my renewal is coming up quite soon. Have used Roboform for quite a few years, and find that it worked better when I used to use a Windows PC, using Internet Explorer. I’ve used a Macbook Pro, Safari OS for the past few years, and although Roboform works well, I have to ‘ask’ it to fill in forms, where before (using IE), the forms and passwords filled in automatically as soon as I hit the page. Also, Robo refuses to fill in certain forms, especially those on Facebook apps. I have to use Autofill for those. Not sure whether I need to alter any settings, but have checked and there doesn’t seem anything else I can change. Brilliant! Will have to do this! This looks like a lot of help!! only recently started ‘comping’ and my fingers ache from filling in all those forms!! Thank you Di for all your good advice too!